Billionaire philanthropist Bill Gates has showered rich praise on companies from emerging nations, including India, for donning the role of 'hidden vaccine heroes' and driving down their cost to about $1 per dose in the global fight to protect kids from deadly diseases. Gates, who is to attend the World Economic Forum's Annual Meeting, on Monday said there is reason to be optimistic than ever about the future progress using vaccines to give all children a healthy start to life. "You have probably never heard of many of the pharmaceutical companies – Serum Institute of India, Bharat Biotech, Biological E, China National Biotec Group, and Bio-Manguinhos, to name just a few – that have become some of our most valuable partners in global health," Gates said in WEF blog. "By harnessing the same innovative spirit that transformed emerging markets into manufacturing hubs for everything... these companies have become leaders in supplying the world with high quality, low-cost vaccines," he noted. 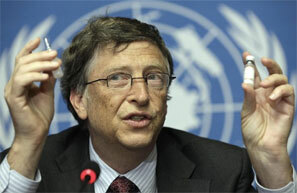 Gates, the founder of Microsoft, is co-chair of the Bill & Melinda Gates Foundation. The increased competition and new manufacturing approaches created by these firms have made it possible to protect a child against eight major diseases. These include tetanus, polio and tuberculosis. According to Gates, Serum Institute produces a higher volume of vaccines than any other company in the world and has played a key role in cutting costs and boosting volumes. The philanthropist mentioned about the progress with the life-saving pentavalent vaccine, which protects a child against diphtheria, tetanus, whooping cough, hepatitis B, and haemophilus influenza type b (Hib) – all in one dose. "When the GAVI Alliance first introduced it in 2001, there was one supplier and the cost was $3.50 per dose. "As demand for the vaccine grew, GAVI encouraged other suppliers to enter the market, and the price tumbled. Now there are five suppliers, and Biological E, an Indian pharmaceutical company, announced earlier this year that it would offer the vaccine for just $1.19 per dose," he said. Referring to various initiatives in emerging markets including India, Brazil and China, Gates said that India's Department of Biotechnology and Bharat Biotech announced plans this year to release a new vaccine against rotavirus – which kills hundreds of thousands of children – for $1 per dose. Despite all the progress, more must be done to target the 22 million children, mainly in the poorest countries, who do not have access to lifesaving vaccines, Gates said.